DRIPPING WITH WARMTH, Afro-Cuban rhythms and sprightly melodies, Nick Smart’s Trogon* presents a lively, listenable programme of originals and arrangements, all led by the crisp, agile tone of Smart’s trumpet and flugel. I’ve been listening to this debut release for some time, its resolute, upbeat spark – both in terms of writing and playing – gradually seeping into my consciousness… and possibly helping to drag me through the final throes of a messy winter! There’s an appealing depth and range to this sextet’s collaborative sound – hardly surprising, given the stature of the personnel. Much-in-demand, versatile electric guitarist Chris Montague reveals his mellower side (away from the punky crackles of Troyka); electric bassist Denny Martinez supplies a fabulously deep, resonant groove to combine well with the sunshine-laden piano of Kishon Khan; and the drums and percussion of Dave Hamblett and Pete Eckford ensure these seven tracks shimmer and glisten with a palpable joy. Nick Smart is renowned in UK big band circles as player and director (Kenny Wheeler, Stan Sulzmann, Troyk-estra), alongside his role as Head of Jazz at the Royal Academy of Music, and brings his considerable experience to this vibrant outing. His own title composition, Tower Casa, revels in its obvious Latin flavour, Khan’s characteristic octaves and chords and Eckford’s embellishments colouring Smart’s trumpet improvisations. A particularly buoyant arrangement of Kenny Wheeler’s familiar Kind Folk finds guitar and trumpet intertwining with remarkably similar timbre, Montague’s typically fluent chordal and solo extemporisations also impressing. Kishon Khan’s writing adds a considerably funky edge to this recording, bass and percussion clearly savouring the piano rhythm of the tambura-introduced Todi or Not Todi; and Smart’s ebullient, gritty trumpet lead encourages the wiry, playful side of Montague’s nature, the whole number just teeming with light and vivacity. Traditional tune, Candela, is arranged as a wistful, delightfully-measured flugel ballad; and Stan Sulzmann’s Round the Round It All (sounding quite different to Sulzmann’s sax-led Neon Quartet version) dances excitedly to Smart’s tune, thanks to Dave Hamblett’s and Denny Martinez’s determined pulse, decorated variously by Pete Eckford’s percussive brightness. Everybody Else’s Song (Wheeler/Smart) shuffles amiably, guitar and trumpet again accurately doubling as front line, as well as displaying their individual melodic capabilities. Finally, Kishon teams up with the leader in penning Mo Tilda, an insouciant carnival sundown tune (featuring some great guitar and piano gyrations) which might well party long into the night. The rich, eclectic and international feel of ‘Tower Casa’ ensures a brisk, accessible forty minutes’ worth of sun-kissed splendour in the company of six accomplished jazz musicians. So… bring on the Summer! Released in Babel Label’s 20th anniversary year (2014), ‘Tower Casa’ is available here. 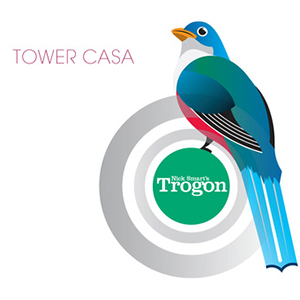 *Trogon (as illustrated on the album art) is the national bird of Cuba.